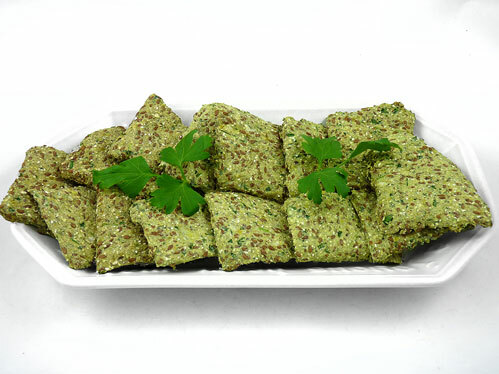 Here’s the way to use up the pulp left over from your morning green juice by using it to prepare crisp breads. Sharing it with the microorganisms in your compost pile is the second best option. Run the buckwheat sprouts through a food processor until mashed. Add flax seeds along with the water, and blend again until mixed in. Keep adding the rest of the ingredients. Adjust the taste, adding more salt or water if necessary, to achieve a good tasting and spreadable mixture. Using a spatula spread the mixture onto Teflex sheets to make a large square approximately ¼ inch thick. Score it with the spatula into crisp breads/cracker-size pieces. When dry, the pieces will break apart at these lines. Dehydrate at 105 degrees for a few hours until crispy, flipping the breads over halfway through. Store in the fridge.